Added a bit of color and the birthday of the characters. Established that we are sometime in 1105 s back-tracked all the players and had a random day assigned as their birthday. I also established their birth worlds. Imperial citizens have that Imperial logo on there, non-Imperial do not. Only Osrum is not an Imperial citizen. All the characters except 1 come from D'Arlee. Max is from Rhylanor as the player indicated his character came from a core world and wanted to get away from a far too civilized world. 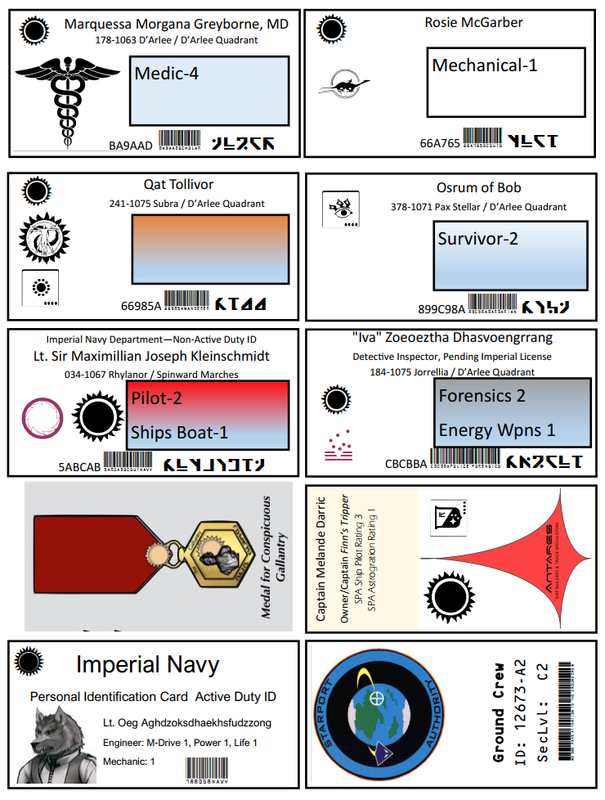 I've also added the card for the Captain of Finn's Tripper, and the lab ship's new chief engineer, as well as a ground crew tag for the port. Just in case I need to have someone wandering around the ship at some port at some time in the future. I've printed it out on card stock and they came out pretty nice, I do believe. I'll be able to hand these out next game night. This is the sort of thing I love to do. I have expanded out my D&D Paladin's backstory in concert with the DM to fit her world. That paladin is the youngest of 8 siblings from 2 different mothers. As the character generation indicated he had a scroll of ancestry, I created his family tree based on maps of Greyhawk as he is of nobility. Back when I played Traveller, I did the same sort of thing with my characters: expanded out the home worlds, and any tech they got I usually designed and got approved by the referee. Only 1 player has the rules for Traveller, although I did send them the link the RPG DriveThru when it was offering Starter Traveller for free. So I don't expect my players to get quite as involved as I do in just creating stuff. The medal is from Meteoric Assault from COTI. As Max has a medal for gallantry, his card is doubled over so he has a copy of the medal as needed.